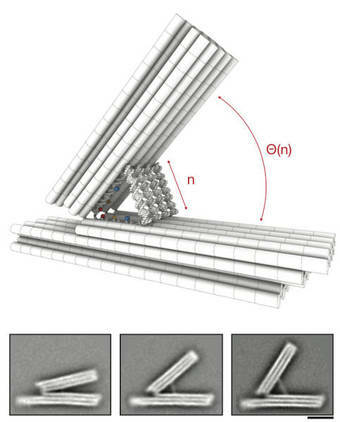 Scientists at the Technical University of Munich (TUM) have built two new nanoscale machines with moving parts, using DNA as a programmable, self-assembling construction material. In the journal Science Advances, they describe a rotor mechanism formed from interlocking 3-D DNA components. Another recent paper, in Nature Nanotechnology, reported a hinged molecular manipulator, also made from DNA. These are just the latest steps in a campaign to transform so-called “DNA origami” into an industrially useful, commercially viable technology. 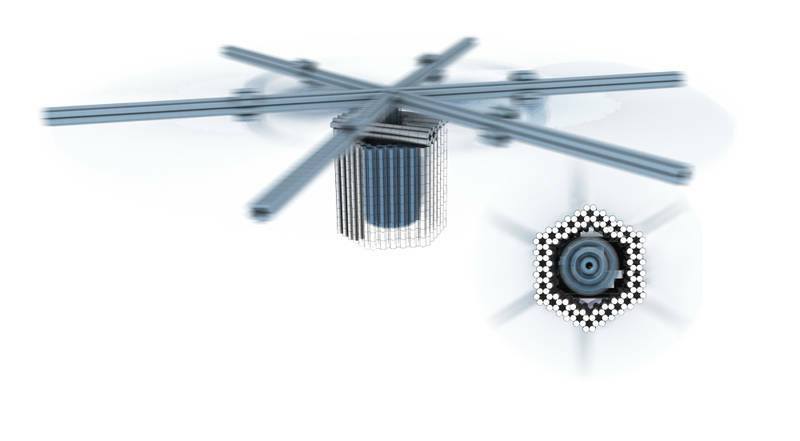 Inspired by nature’s nanomachines – such as the enzyme ATP synthase and the motor-driven flagella of bacteria – physicists in Prof. Hendrik Dietz’s lab at TUM keep expanding their own design and construction repertoire. They have systematically developed rules and procedures for creating self-assembled DNA origami structures with ever greater flexibility and control. Moving from DNA basepair matching to shape-complementary building techniques – with a variety of interlocking “bricks” – the researchers’ toolkit has advanced steadily in the direction of higher-level programming and modular assembly. In step with this progress, they have honed methods needed to verify, for example, that a particular soup of nanoparticles really is packed with copies of whatever they designed: whether a switchable gear, an artificial membrane channel, an arbitrarily complicated test object, a “nanobook” that opens and closes, or a robot figure with movable arms. Doctoral candidates Philip Ketterer and Elena Willner collaborated with Dietz in building a rotory mechanism from three multilayer DNA building blocks: a rotor unit, with a body roughly 32 nanometers long and a longer, lever-like extension; and two clamp elements that “click” together to form an axle bearing. The parts join with a tight fit and leave just 2 nanometers of play around the axle, allowing the rotor to swing but not to wobble. In one variant, the arm will rotate freely between random stopping points; in another, it will dwell in specified positions the researchers call docking sites. To date, this is the most complex rotary structure realized using DNA origami techniques. 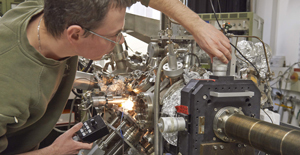 In a separate project, Dietz and doctoral candidate Jonas Funke created a hinged machine on a scale suitable for manipulating individual molecules with atomic precision. 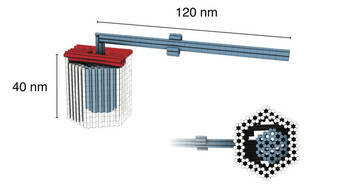 The angle between the gripper’s two main structural elements can be controlled with DNA helices. Experiments with this DNA origami positioning device showed that it could be capable of precisely placing molecules, adjusting the distance between them in steps as small as the radius of a hydrogen atom. 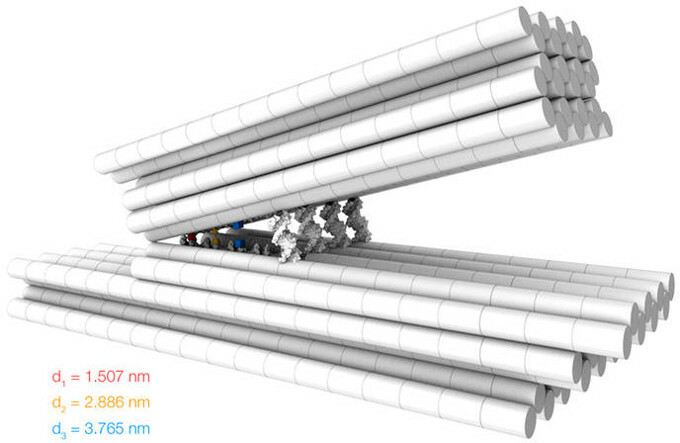 This work is significant in that it bucks a trend in the field toward building larger DNA origami devices without necessarily pushing the limits of precision. In addition, the results hint at one of the ways DNA nanomachines might someday be useful to control chemical reactions. 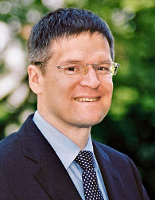 This research has been supported by the European Research Council (Starting Grant to H.D. 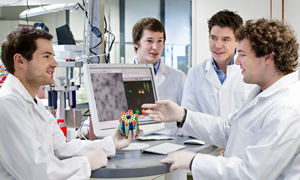 ); the German Research Foundation (DFG) through Excellence Clusters CIPSM and NIM as well as Collaborative Research Center (SFB) 863; the German-Israeli Project Cooperation; and the TUM International Graduate School for Science and Engineering.